With a number of athletes missing and a number making their debut in League competition, some taking on events for the first time to help the Team or just starting out on Track & Field, it was always going to be a tough day, but that didn’t dampen the spirit or the effort of the athletes with new PB’s for U15 Leon Thomas in the 200m (29.7) and 800m (2.25.3) following which he helped the team out by doing the Long Jump for the first time ever and placed 5th with 4.09m). 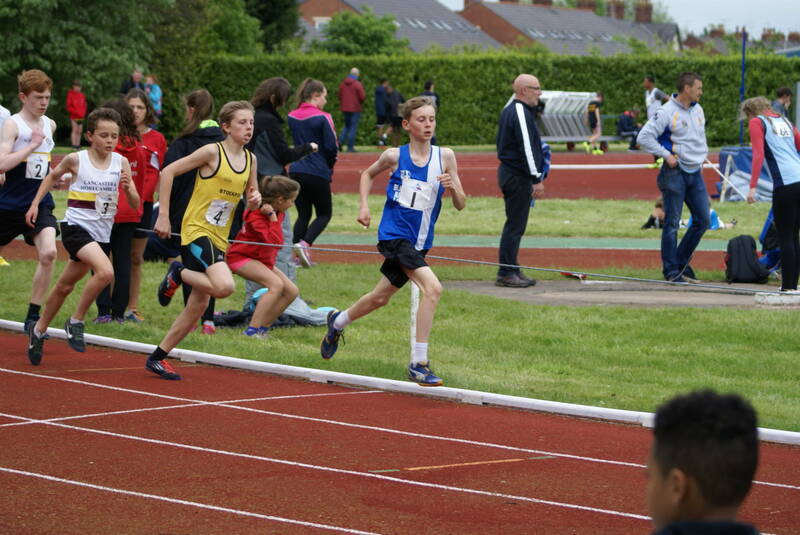 U15 Jamie Teare cut another second off his 1500m time with 4.46.6 whilst brother Rory Teare (U13) set new PB’s in the 100m (15.5) and the 75m Hurdles (15.5) before jumping 1.30m in the High Jump for 3rd place. 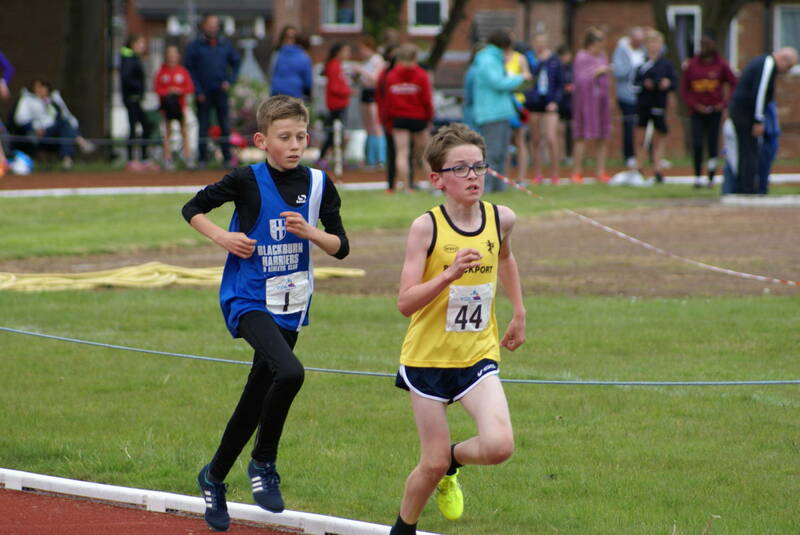 U13 Kyle Taylor-Pomfret cut 4 seconds off his previous best in the 1500m running 5.19.9 in the ‘B’ Race and added a 32.4 in the 200m, an event he has never done and took 2nd in the Shot Putt with 5.30m. 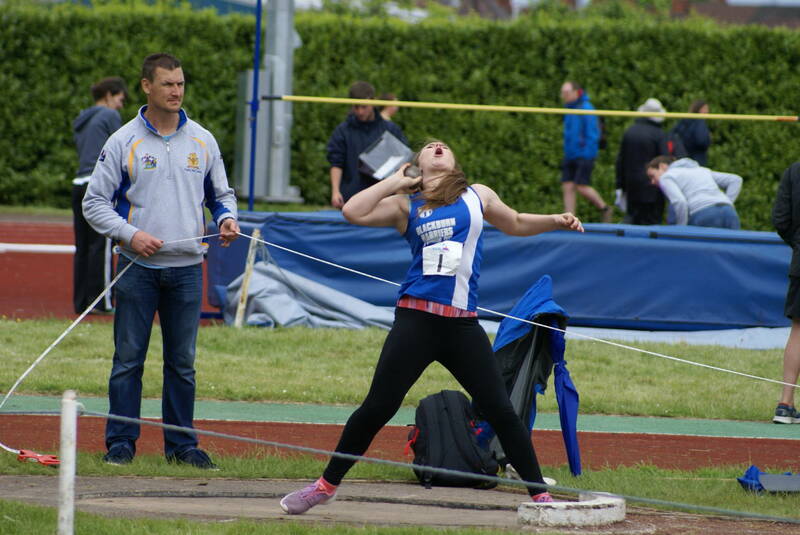 Kieran Carroll added two metres to his best in the Javelin with a 2nd placed throw of 22.29m whilst U15 Amy Davies knocked two seconds of her PB with a 3rd placed run of 5.11.3 in the 1500m. 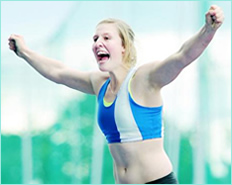 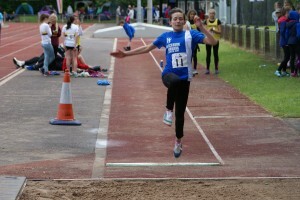 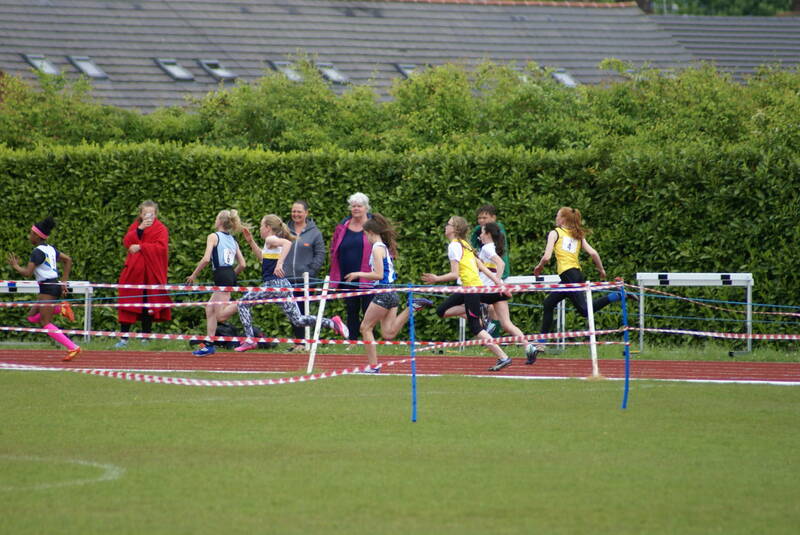 U13 Libby Ansbro set a new PB in the 75m of 11.0 seconds and Caterina Lombard put her Shot Putt PB up to 4.14m and finished 2nd in the ‘B’ Javelin with 11.49m, an event that she hadn’t done prior to the fixture. 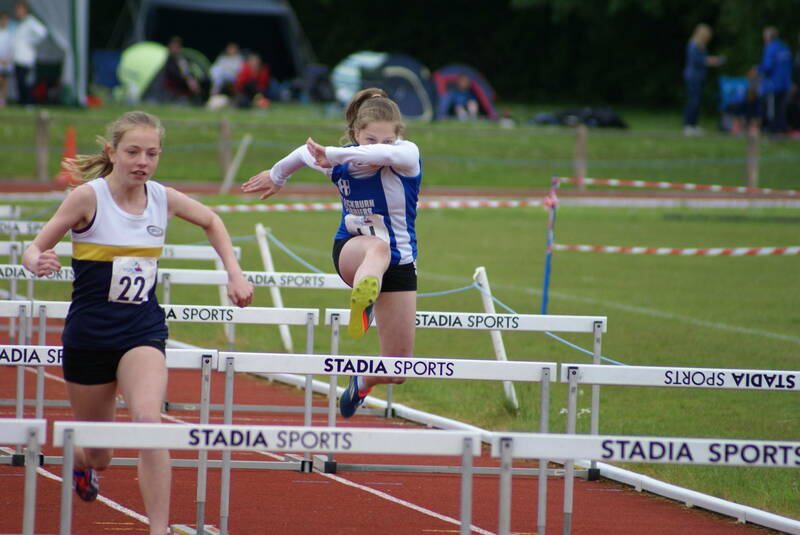 There were good wins on the day too for U15 Jamie Teare in the ‘B’ 80m Hurdles (15.7) and for U15 Eloise Littlefair winning the Javelin ‘A’ (28.59m) and taking two good second places in the Shot Putt (10.30m) and Discus (23.43m). 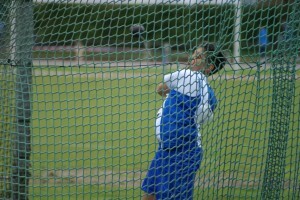 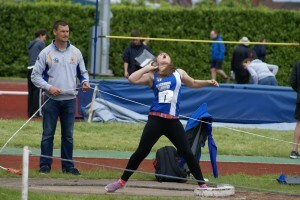 U15 Alex Bernstein also racked up a double win in the Discus (26.27m) and Hammer (36.44m) and then added a good 2nd in the Shot Putt with 7.73m. 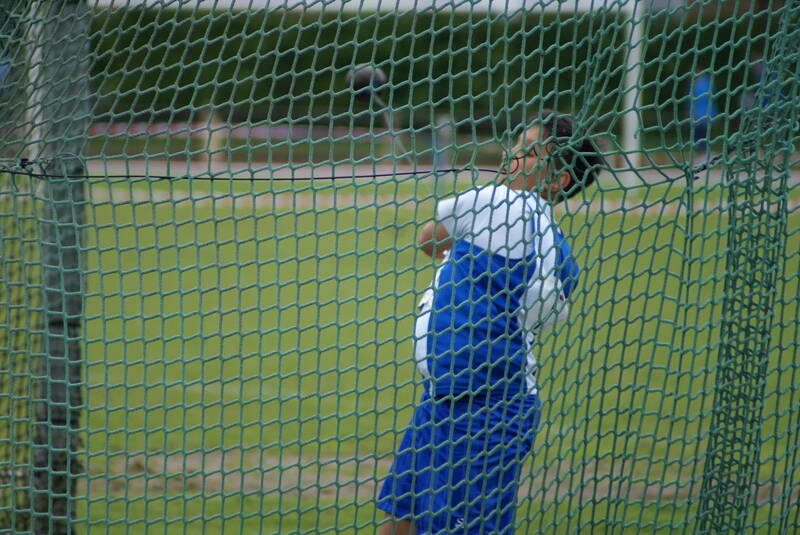 U15 Cameron Harris, another young lad in his first season competitively followed suit with a double win in the Javelin ‘A’ 30.07m and Discus ‘B’ (17.80m) before adding a 5th placed 7.84m in the Shot Putt. 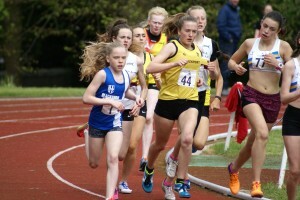 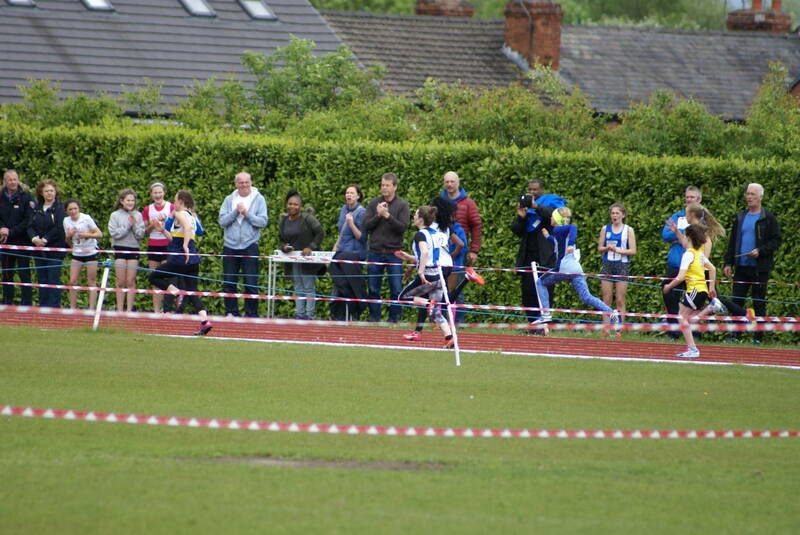 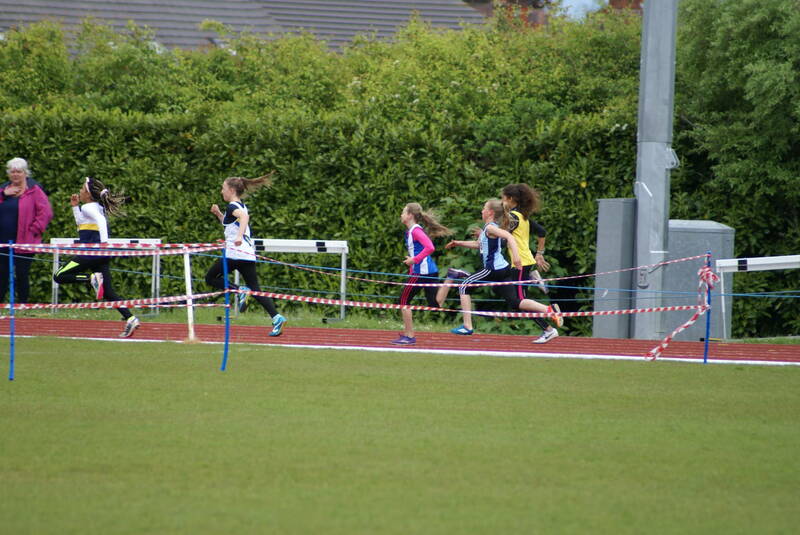 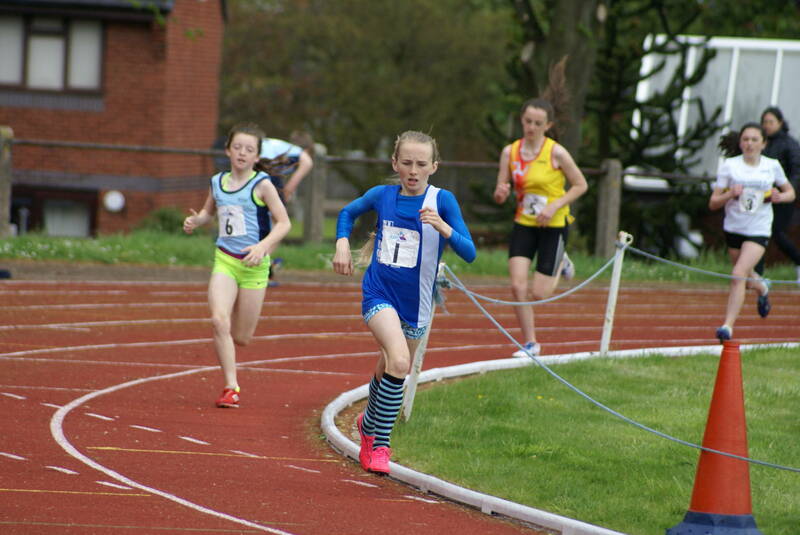 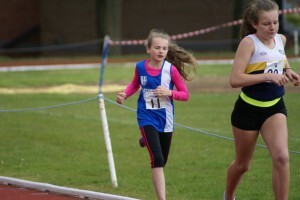 U13 Charlotte Corrigan took 3rd in the 1200m (4.18.1) in a race which saw the front three separate themselves from the rest of the field, staying together until 200m out when the Trafford athlete pulled away to win. 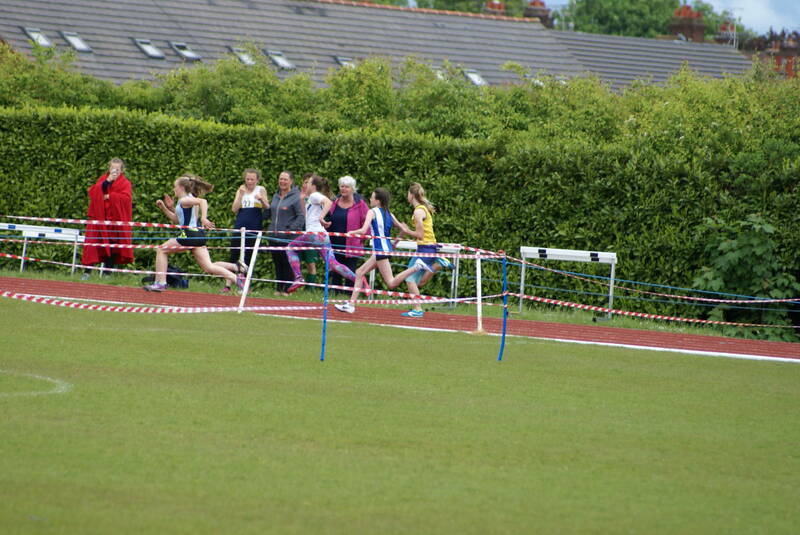 U13’s Eleesha Charnley and Leah Hoole both took 4th places in the 800m with 2.36.3 and 2.46.3 respectively. Eleesha teamed up with newcomer Emma Love in the Long Jump with Emma clearing 3.91m in the ‘A’ and Eleesha 3.81m in the ‘B’. 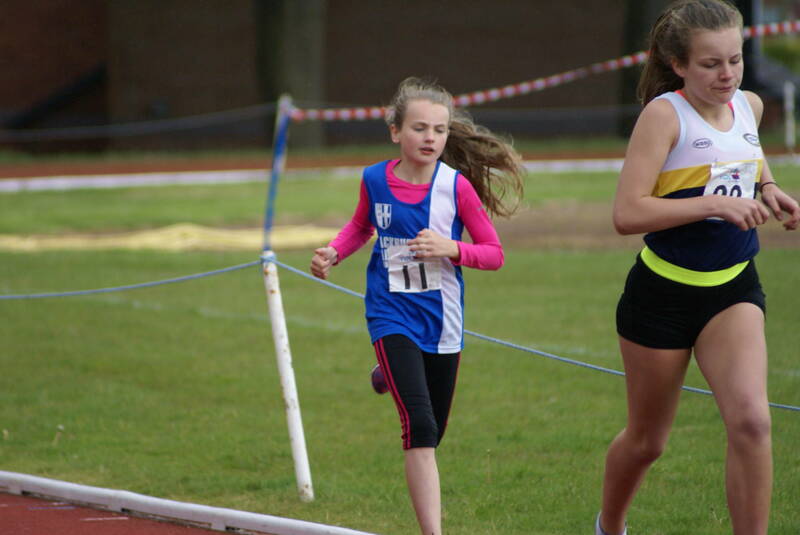 There were some first time competitors in the sprints for U13 Caiden Hesketh (7th) who ran 11.7 in the 75m and Libby Ansbro 11.0 seconds (5th). 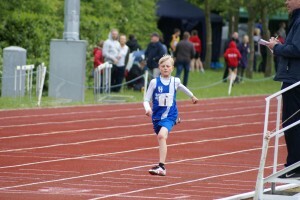 Caiden then ran the 150m (6th) in 22.5 while Emma Catterall ran 22.8 in the ‘B’ race. 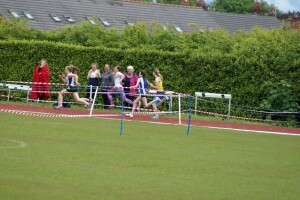 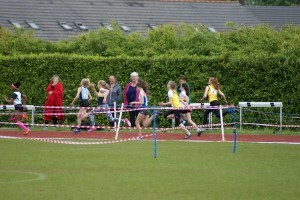 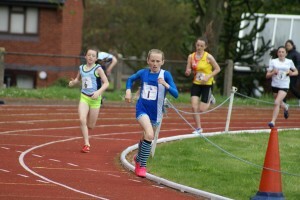 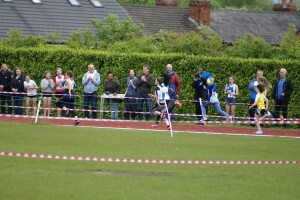 U15 Phoebe Baxter ran 14.4 in the 100m for her first outing of the season. 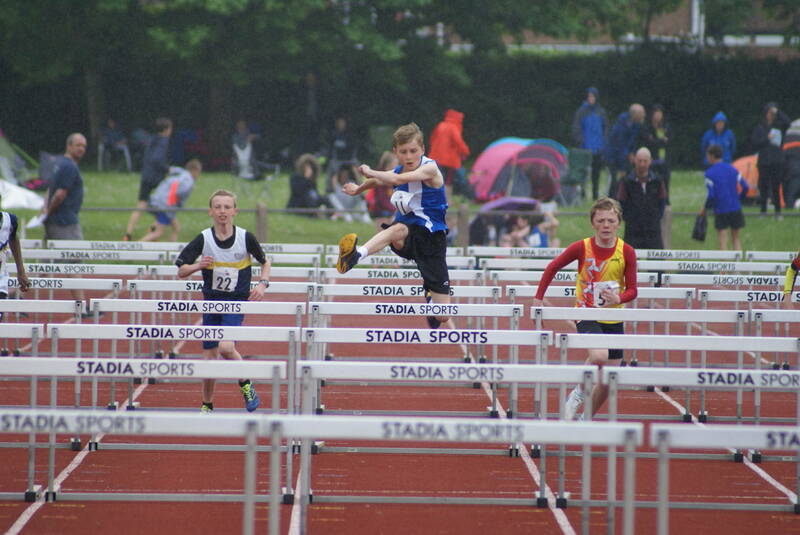 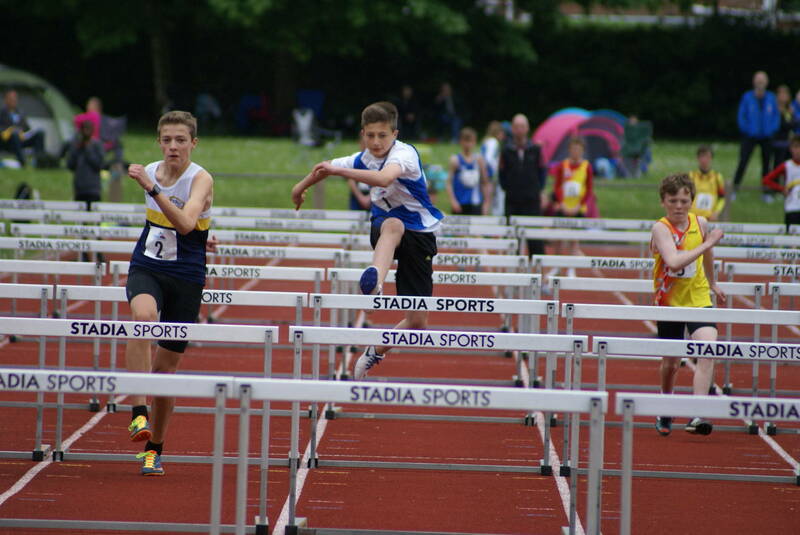 U15 Solomon Brown finished 4th in the ‘A’ 80m Hurdles with 14.2 and jumped 4.38m in the ‘A’ Long Jump to set a new PB. 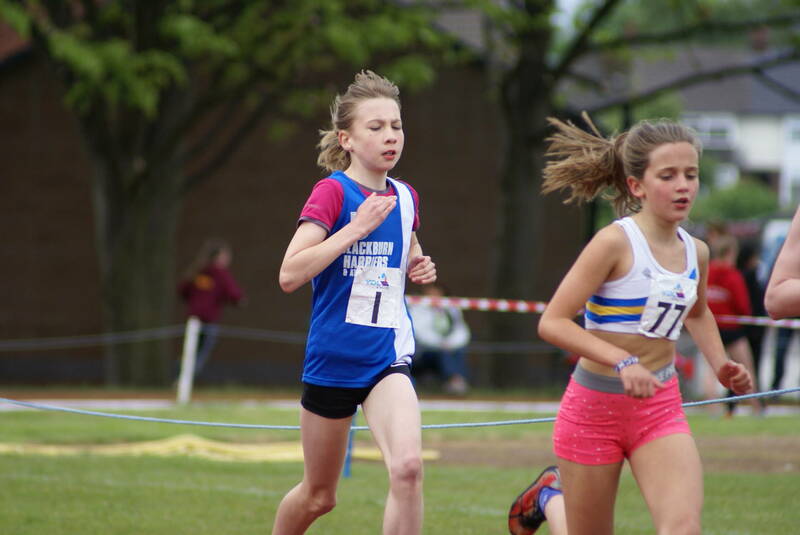 Real consistency from Myah Booth again in the U13’s as it was with the improving Christie Sturgess. 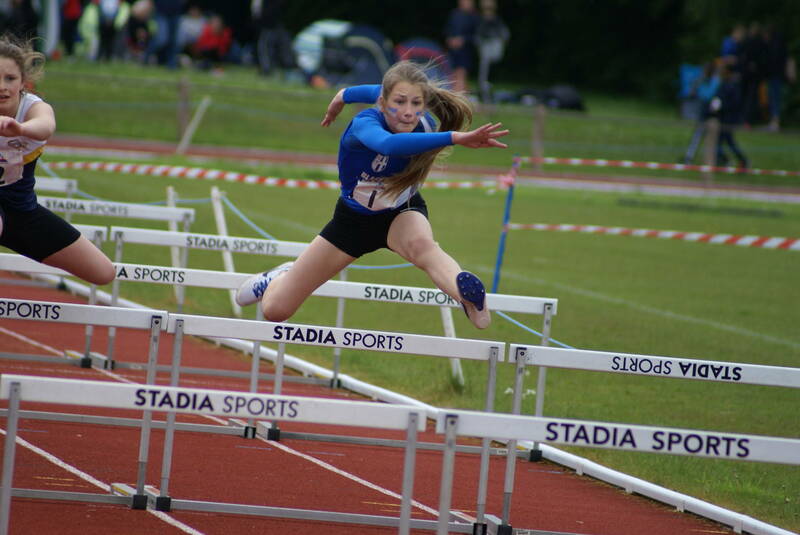 Myah came in 2nd in the 70m Hurdles ‘A’ with 12.2 , and added 2nd place in the ‘A’ Javelin (23.30m) and 2nd again in the ‘A’ Shot Putt (8.65m). 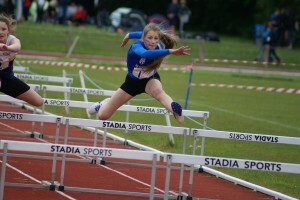 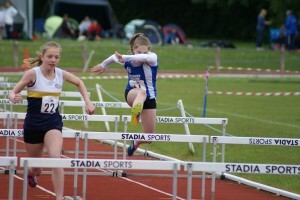 Christie also took 2nd spot in the ‘B’ 70m Hurdles with 13.0 seconds adding good points to the Team total. 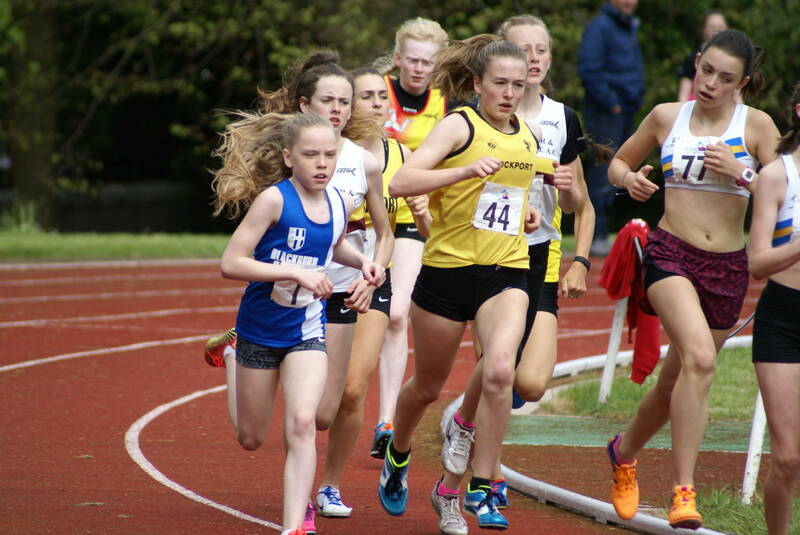 Liberty Thompson (U15) was having her third 800m race this year and is bringing her times down steadily finishing 6th with a time of 2.44.5, a six second improvement from her first race. 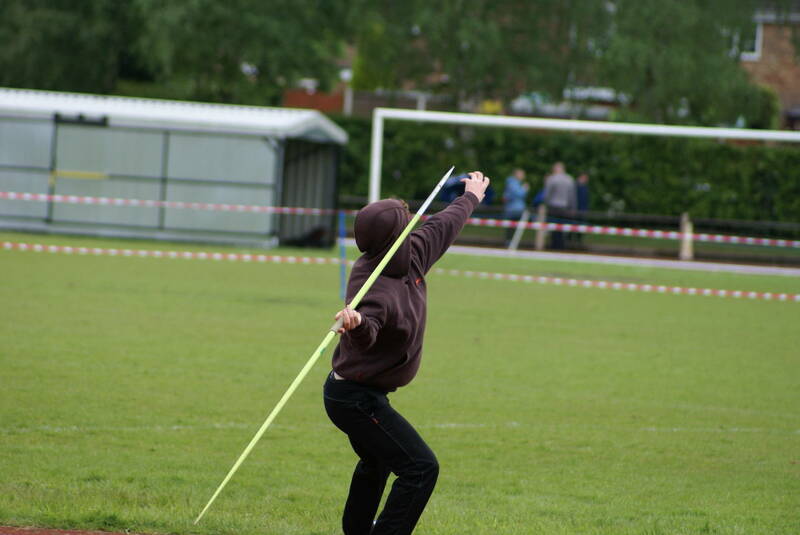 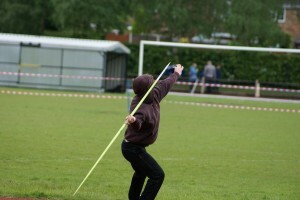 U13 George Whittaker earned good points in the ‘A’ Javelin with 2nd place (17.92m) and then had a go at the High Jump to fill in for the Team, clearing 1.15m in his first ever attempt at the event. 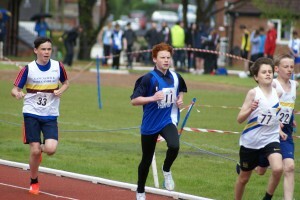 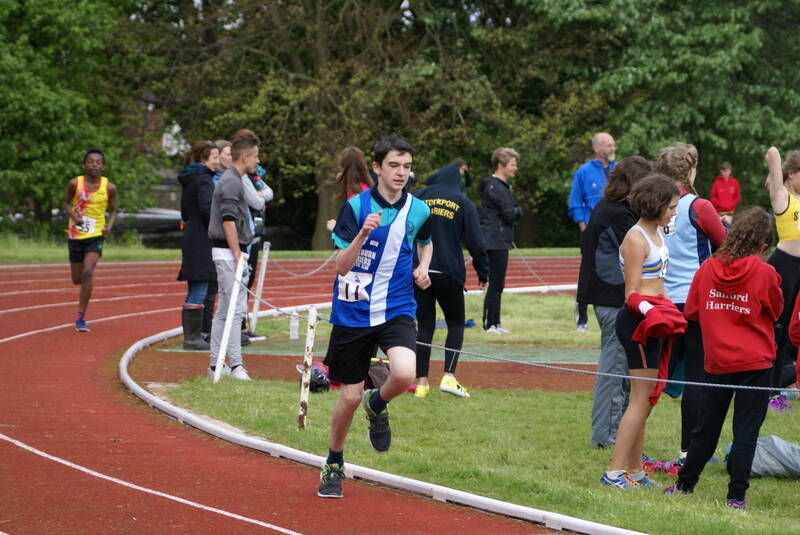 Brother Ben Whittaker (U15) and nursing a sore foot ran a solid 13.1 in the ‘A’ 100m (5th) and 26.5 (3rd) in the ‘B’ 200m. 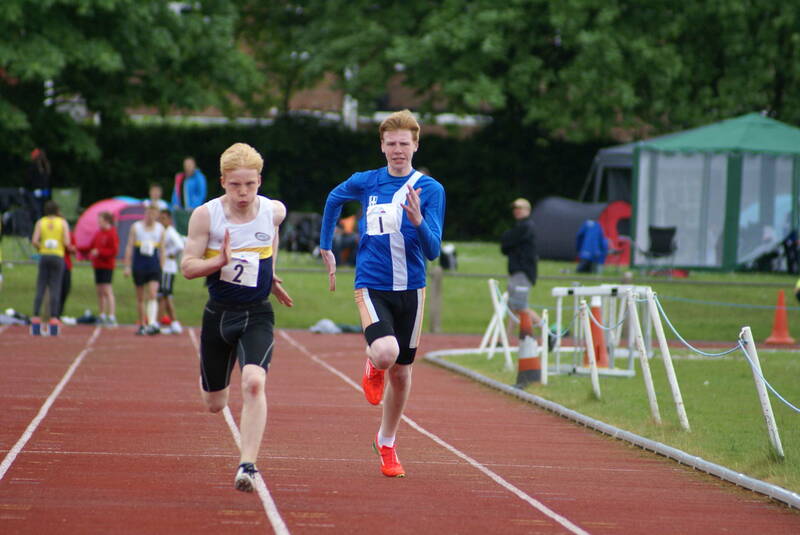 Another debutant – Bradley Meikleham came in 6th in the ‘B’ 100m with 14.4 and added a 3rd place 18.89m in the ‘B’ Javelin and ran 5.21.9 in his 1500m debut. 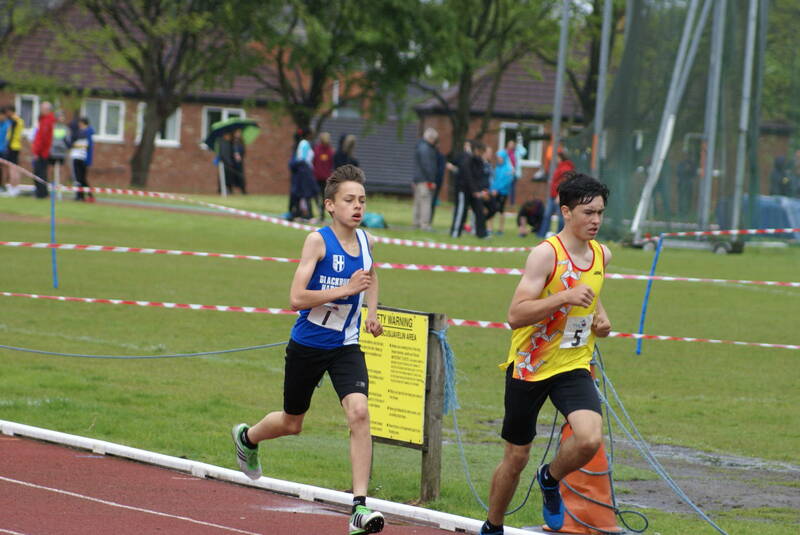 U15 Ethan Joyce in his first competitive season stepped into the ‘A’ 300m and ran a good race (5th) in 45.3 and then, moving outside of his comfort zone to help the Team he ran the ‘B’ 800m in 2.35.8 (6th). 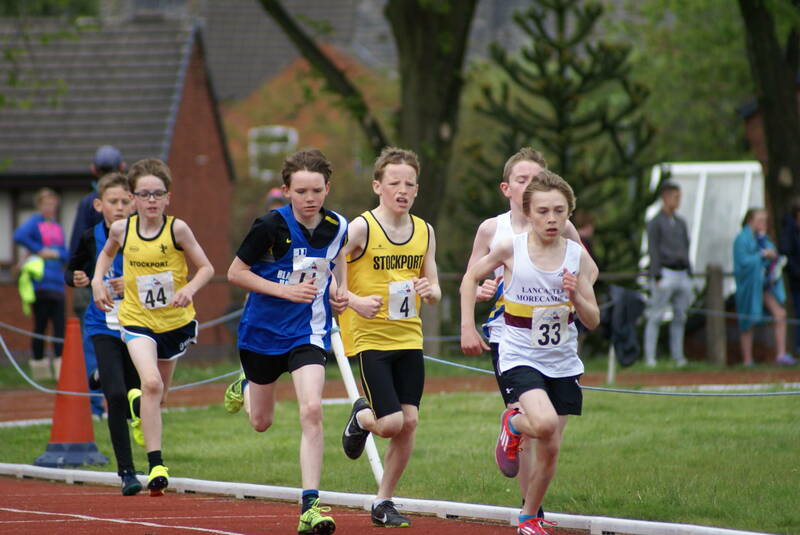 Younger brother Joseph Joyce (U13) showed the same spirit running the ‘A’ 1500m for the first time ever finishing 5th in 5.15.1. U13 Ethan Barbarewicz is in his first season and didn’t blink an eye when asked to do the 200m coming home 4th in 30.7 and then running 2.45.1 in the 800m for 2nd place and just outside his PB set this year. 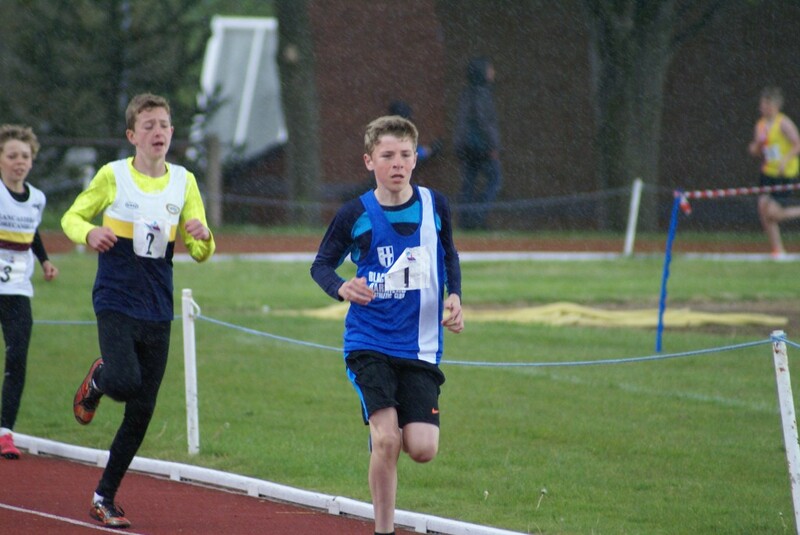 Harvey Ashworth was the ‘A’ runner in the U13 800m and ran a good race, placing 2nd in 2.33.5, just three tenths outside of his PB. 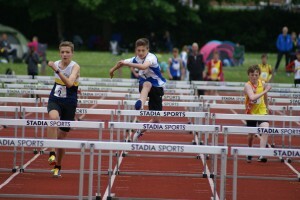 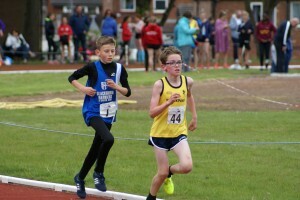 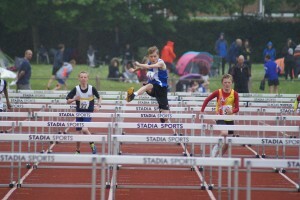 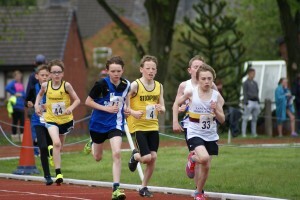 U13 Tom Booth squeezes everything out of himself when he races which is really great to see, running 15.4 in the ‘B’ 100m.